Baby Bliss with Jordan & Chris: Walka-walka! 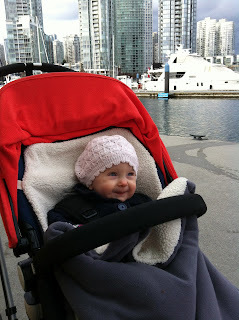 Chris has a new love, and it's our Bugaboo Stroller. It wasn't love at first sight though. In the beginning he thought my desire for another stroller was ridiculous and unnecessary, but this all changed in Toronto. Our fantastic Bugaboo Cameleon became home base for all-day-long outings in the City and Eloise would demand to "walk-walka" in her stroller as soon as we got up. During our time in Toronto this stroller was simple to maneuver down escalators in the subway, light enough not to break (too much of) a sweat when faced with carting it up flights of stairs and easily held everything we needed for a day of exploring. Eloise loves being in the Bugaboo so much that as we get ready to leave the house now she likes to sit in her stroller and puts the straps on herself (well, tries to anyway). Eloise loves that she can see everything from the upright position in the Cameleon and she's happy to recline and nap in there too. I love that you can customize Bugaboo strollers with different fabric sets (hello Bugaboo + Missoni!) and accessories. Ours clearly could use a little pink. I asked for a Bugaboo for my birthday this year after a bad experience traveling with our gargantuan Valco Tri-Mode Ex stroller during my last solo trip to Toronto. Don't get me wrong, the Valco is a great stroller for running and walks outdoors, but it is practically hazardous basically anywhere you're faced with less than a six-foot turning radius. If the Valco is an SUV, the Bugaboo is a crossover. Thanks to Craigslist a hardly used, navy blue Cameleon has been my new best friend for months. I think it's pretty sweet that Chris is smitten now, too.